The first to link Buda with Pest, Széchenyi Chain Bridge has become an icon of the capital’s modernisation. For centuries, Buda and Pest were different places. Buda, spread over the hilly western bank of the Danube, was the traditional seat of royalty and nobles, and is still home to the Royal Palace. Pest, “flat as a prairie”, was a merchant town on the eastern bank, full of noise and activity. Amazingly, it took until the 19th century for these two settlements to join into a single capital. 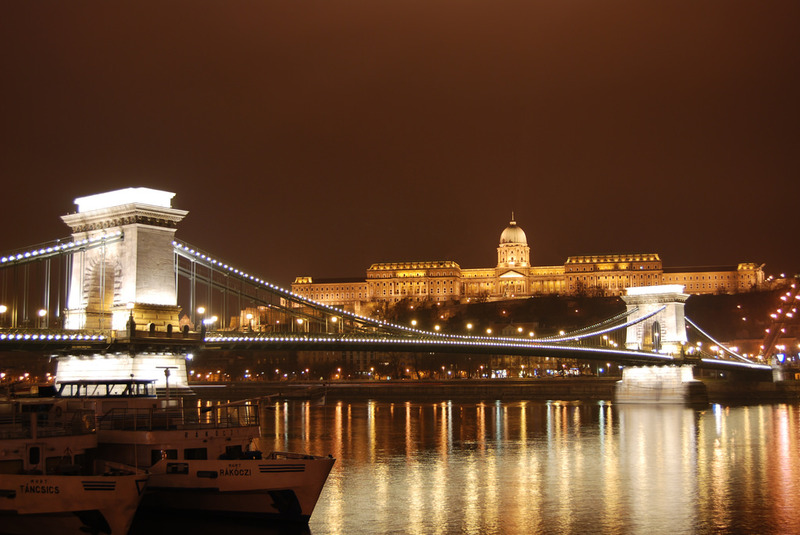 This became a reality in 1849, with the opening of the Széchenyi Chain Bridge. Designed and built by English engineers, it looks like a bit like a scaled-down Brooklyn Bridge. The name comes from István Széchenyi, a statesman who supported the project and is now remembered as a kind of Hungarian Churchill. The bridge touches some of Budapest’s major landmarks, including the funicular railway leading up to the Royal Palace, as well as the Zero Kilometre Stone. This makes it perfect for a walk in the middle of your day. Easy to do, because the bridge has safe pedestrian paths. The views across the Danube are supposed to be second-to-none, at night as well as day, with the glitter of city lights. Make the most of it, because the bridge is due to close in 2019 for three years of renovations. At night the illuminated bridge becomes even more recommended and the anchored bridge to two main pillars, transform into a bundle of lights thanks to a hundred spotlights: an image that you will never forget.